The need to get exposure online is important for many businesses. One quick way to be discovered online is to get your business listed in Google Maps. 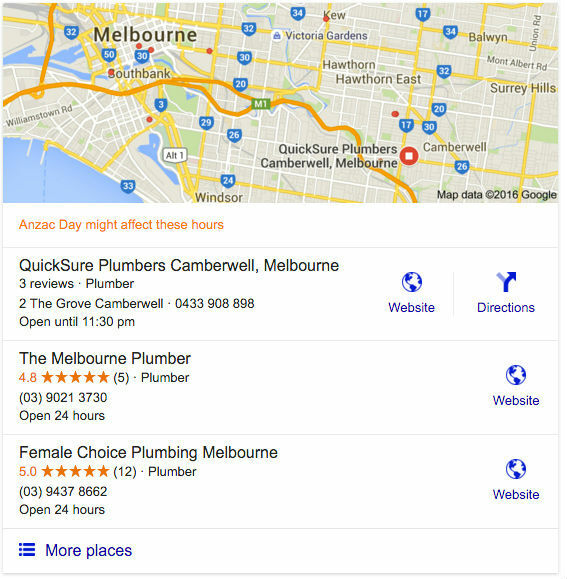 If you type in a search term, such as “Plumber Melbourne” you will notice that 3 local businesses will be featured prominently on the first page of Google along with a location map. Getting listed here is an easy thing to do using Google My Business. All you need is a google account to get started. You’ll also need to verify that your business exists. The easiest way to do this is to verify your website in Google Search Console (formerly Webmaster Tools). This requires you to upload a small HTML file to your website’s hosting account. Be sure to use the same google login address as your Google My Business when you verify your website in Google Search console. By doing this, you will find that you will be able to bypass the process of waiting for a postcard with a verification code to arrive from Google. With delays in mail delivery, it could take several weeks before you receive the postcard. You can learn more about verifying your business here. 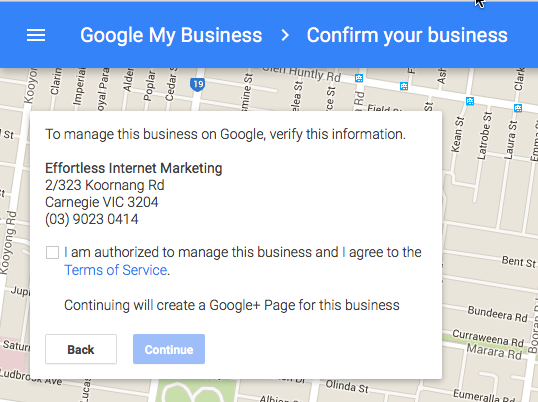 Once you have a Google Account and are logged in, you’ll see a map asking you to locate your business. This is so Google can check that the business is not already listed in maps and connect you as the business owner to your business. Don’t worry if your business it not listed, you will have the chance to add it later if it does not exist. 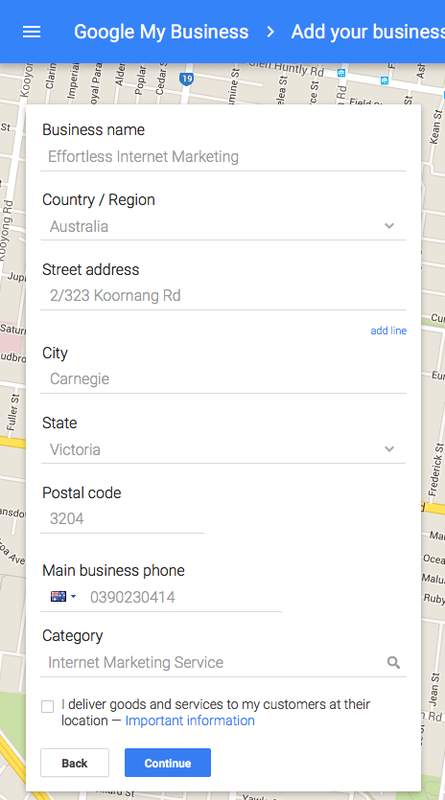 Once you enter in your business address or name, Google will try and find locations that match. 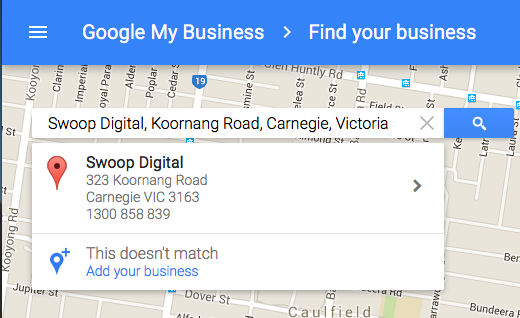 If the businesses and addresses are incorrect, click on the “Add your business” link at the bottom to proceed. From there, you will be able to complete a form and provide important information about the business as you can see in this example below. It’s important to note that if you don’t have a physical location, you can still list in Google Maps – just tick the box saying that “I deliver goods and services to customers at their location.” If you do have a physical location, then do not click the box. If you haven’t verified your website in Google Search Console or used a different email login to verify your site, then you will need to verify your business by mail. This involves waiting for a little postcard to arrive. 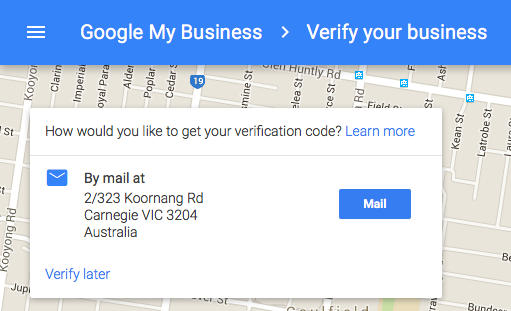 That postcard has a pin number on it and you will need to use that pin when you log back into your Google My Business account to verify your listing so your maps listing can be live. Be aware that the business listing can take a few weeks to arrive. It’s a good idea to let whoever picks up your mail to know you are waiting on it – otherwise they might accidentally throw it out. This can stretch out the time it takes for the business listing to be approved. And its a key reason why we recommend verifying the website first in Google Search Console. Once your website is verified, you will start appearing in local Google Search and you have the opportunity to feature in the premium listing on page 1 of Google for your key search term. Getting that all important listing will propel your local business forward and help you generate a higher number of enquiries. If you are not an established brand, it can be a little more difficult to improve your visibility online. That’s where listing your business on free directories can help. The best one is Google My Business. It’s Google’s entry level product and it’s free. It gets you listed on Google Maps and makes you searchable across the web and in our mind is the most important listing you should get. This is a great free listing service where you can add your business. It’s a relatively straight forward process to get a listing. They will contact you though and try to upsell you into other packages. This is more of a review site than a directory listing. You can’t just list your business here – someone who wants to review you adds you. So if you have a happy customer, it’s a good idea to encourage them to review you. This is free but this is more relevant for businesses that have a presence in the United States. Some categories are competitive so you may not be able to get a free listing. You won’t know until you try. It’s a good little lead generator for Yellow Pages who will try and upsell you into their paid online packages and also sell you Google advertising services using their Click Manager. It’s an entry level product and they get commission of sorts from Google. If you want access to your data (and we believe you should), then it may not be the best product for you. Like Yellow Pages, White Pages also offer a free listing. You’ll probably have a similar experience to Yellow Pages. It’s worth considering. This directory is simple enough to use. Australian businesses can list there so it’s not a bad option. There’s no guarantee your free listing will appear as they get an awful lot of submissions every day and don’t have the resources to keep up. Yahoo also offer a paid listing which will set you back US$299.00. Getting yourself listed on some of these listings mean some of the larger businesses with an established salesforce will try and upsell you into their online advertising packages. Yellow pages and Aussie Web are two such companies. If you don’t to be hassled by a sales rep, consider avoiding them. Otherwise expect a call tying to upsell you. Other directories worthy of consideration include directories in your local council or any business networks you belong too that have directory listings. So it’s worth visiting your local council website and seeing what they offer to businesses. Home One charges a fee of $220 for 13 months. Whilst it’s not free, this may be worth considering if you are the right market. Whilst this is not a free listing, at the time of writing the fee to advertising started from as little as $69. That’s pretty cheap advertising in my book. Above all, look for directories that are reputable and trustworthy. Quite time back now, some directories got caned by Google. Your objective is not to be listed on every single one of them. Go for the most reputable and trustworthy sites only. When you do list, please ensure the information you place on them is consistent across all the directories. There are many reasons why. The main one being that consistency helps improve local SEO. If you decide to pay to advertise in some vertical specific markets, we recommend using the Google URL builder so you can measure where your traffic is coming from and which ones give you the best results. You can find a handy tutorial for it here along with some other tips on how to measure your marketing effectiveness. Finally, if you are a small business and a member of the Flying Solo community or serve start ups and small businesses, why not get yourself listed there. If you need help putting all this together, contact us. We have a lot of experience in helping businesses of sizes grow. At the heart of every business are customers. More importantly, having a way where potential customers can find you online. Google have helped make the process of customers finding you a little easier with the launch of Google My Business in June. Like the former Google places, Google My Business allows you to update your business info, add photos and virtual tours of your business and stay on top of reviews, however with the integration of Google+, it now enables you to share news and events with your fans. 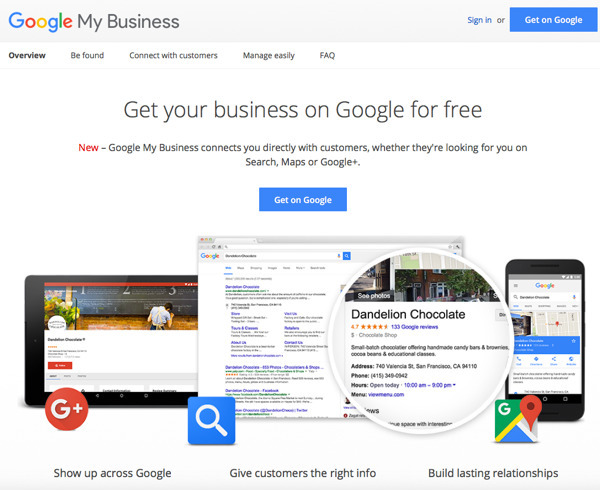 Your business will also show up in search, maps and Google+. If your business has multiple locations, you can upload a spreadsheet with all the location information. An added benefit of the integration is that you may now potentially be able to change ownership and management of your Google places listing. This was previously almost impossible to do. Many businesses have different Google accounts and logins for their places listing and Google+ page. It was a massive pain. The problem was there were no way to change ownership of the Google local listing and merge the two different platforms together easily. The trick is to change ownership of your Google+plus page to the same email address as your Google+ local page. Once both platforms share a common owner, you will be able link your Google+ page with your Google+ local page and delete the old account. Any reviews you have accumulated over time will also be merged making the transition seamless. Now if you don’t to retain that old account that now houses all your Google Business page and listing, it is just a simple matter of changing the page owner back to your preferred Google account and deleting your old account if you no longer use it. It sure beats having to login into multiple Google accounts all the time. Managing your information on the go is also a lot easier with the addition of Android and iOS web apps. So why has Google places changed? According to a recent Google Partner hangout, a key driver of the change was mobile. Previously, it was difficult to manage your business on the go via mobile. Now its a lot easier. Another major pain point was that it was not easy to transfer ownership of your Google listing to a new owner without surrendering your Google logins or starting a new listing by scratch (thereby compounding the issue of inaccurate and difficult to update listings. Now its a lot easier to transfer ownership and merge accounts. If you have ever had the heartache of trying to change your business address details in the past, this integration may provide an opportunity to clean up and resolve any issues once and for all. Have you made the change yet? We have and are thrilled with the ability to have one login to manage everything in one place. Search engine optimisation has changed significantly over the past few years. So much so, that old SEO techniques have put many businesses at risk. This has lead many to claim that SEO is dead. The fact is, SEO still exists and it still is important – it’s just the form of SEO has changed. What has changed is that it is harder for people to trick search engines into making them rank. Old techniques no longer work. Below is a recording of a webinar we ran that uncovers what has changed and how you can succeed today. It’s no longer about keywords, rankings or even back-links. Those days are long gone. There are 3 key pillars to being found. SEO – which includes the foundational aspects of having a good site structure as well as the technical aspects of understanding meta data, keywords and schema data. These 3 pillars are a triage that helps bring lifeblood to your website and your business. Together they work as a system to increase your visibility, build your brand and grow your customer base and profit. As anyone who has ever been burnt by a manual penalty from Google would know, relying on backlinks alone is foolhardy. It can take a long time to recover and some websites never recover (depending on the type of penalty). It’s a high risk game. Credit companies know it – in fact they restrict credit for SEO companies because they know there is a high risk that the SEO provider may need to provide refunds to their customers. So SEO companies mitigate this risk by providing meaningless guarantees and watertight contracts for things they can’t control. The fact is, SEO is risky business – for you, the bank and also some SEO providers. Google are simply becoming increasingly good at detecting bad links. Period. If you want to have a restful nights sleep, then don’t put your business at risk. Would you give your bank account details to a robber? Doing things the right way means you get to sleep well at night. Get your foundations right before you build your next website. SEO can help with site structure and ensuring your website has a good chance of being found it if has the right foundations. You then need high quality content that appeals to your target market. The content has to be great, well written, and well researched. It could even provide unusual or industry specific insights and visually appealing images. Once you have great content – you need to share it. Syndicating it on appropriate social media networks that are relevant to your target markets can be effective for this. Cynical? Not convinced about social? I know it can be hard to see the link between social media and SEO. You may have tried social media with limited success. Google has also publicly stated that Twitter shares and Facebook likes are not part of their ranking algorithm (Google+ is another matter). This may be true but that is not the point of social media. The point of social media is to make your content discoverable and build relationships with your customers. Your content needs to be great to be discoverable. Ideally it needs to generate shares, likes, comments so people can get to know you and trust that they wont have a negative experience if they buy from you. Once discoverable, you put strategies in place within your sales funnel to generate sales, leads, engagement – whatever your goal. Underpinning it all is a strategy. Thought, planning and time need to go into the process. Sadly most of us lack the time to put enough thought and planning into a process to make it effective. Often, business owners think that they will write the content, share it on social media and do everything themselves. Doing it yourself is a recipe for failure. Too often they start with the best intentions but lack the follow through or knowledge to do this well. I’ve seen a lot of businesses try this and fail. If you think you can do all this, then I salute you. Most businesses will find this difficult and if so, they should consider outsourcing it. Why Google AdWords is essential for marketing your business online? In this video, we cover off why we recommend starting off with Google AdWords and how much budget you should be allocating towards it. There are also some free tips and tricks that will come in handy while running your AdWords campaigns. How to drive quick traffic to your website using Google AdWords? How much time does your campaign need to be refined? When can you expect the best results? How much should you invest in your Google AdWords campaign? How can you improve your bidding strategy? How should you be measuring success? Liked it? Don’t forget to share your comments with us below. Hi. My name is Carol, and I am from Swoop Digital. I prepared this short video today to talk about Google AdWords and why we often recommend it. It’s the first point of call for many businesses. The first reason is that Google AdWords has immediate impact. The ads can show straight away and can get traffic to your website very quickly. So, that would be the main thing. Unlike SEO which can take quite a long time for it to work, and you don’t even know if it’s working straight away. But with an AdWords campaign, there’s a couple of important things to really understand. The first thing is that it can take about eight to 12 weeks to really refine the campaign. Of course, that is going to be limited by your budget as well, but really in that first, especially in the first month, we’re really trying to refine the campaign, discover what works, develop a bid strategy, and really focus on what words are going to convert best for you. So it can take a bit of time to find that out, particularly if you are on a lower budget. So we find that the best results with AdWords generally happen after that three-month period or within that three or four-month period. Then, of course, we just refine from there as well. Now, the other thing is, it’s one of the questions people often ask me is, how much should I spend on budget? Well, the problem with having, you can spend as little or as much as what you like. If you had a small budget, it might mean that you have to run your ads on fewer days because we need to have an appropriate amount of ads streaming in a certain day for it to be able to work and get to see what works. You can always do AdWords in a really low budget. Having said that, this is why we recommend for it as well but the beauty of AdWords is you can spend as little or as much as what you like. You want to be able to go for … You want to be able to have enough data to be able to make decisions on what is happening. It is really about using the budget, understanding what’s working, and really getting research and insight into what is working, why it’s working, and really understanding that. And apart from that, you can use the data to improve the content on your website as well because you’re getting insight into how people are searching, what they’re looking for, and you can work out strategies on how you can actually help them. So that’s a really great benefit of AdWords. Now, the one important thing and it is crucial impact that with AdWords, it’s really important to have proper tracking in place. And That can be done in a number of different ways. It can be done by a contact form. It can be done by tracking telephone calls, but really the important thing when you’re using AdWords is to get an understanding of what is driving that conversion. And If you don’t have tracking measures in place, it’s really hard to refine the campaign and to really understand what is working and what isn’t. Otherwise, without tracking, it becomes all about getting clicks to the website and getting people to your website, but it’s actually not telling you what is working, what isn’t, and that’s the important part because it’s one thing getting traffic to your website but it’s quite another thing to actually get someone to pick up the phone and call you, and you want to know what drives that and what causes that because that is the only way that you can improve. Once we understand that, we can really focus on the things that work and really focus on then reducing the cost per click, increasing your click-through rate, and increasing that conversion rate. And you know conversion rate is going to be the most important measure of how and the number of leads you get because you really need to be able to … The whole point of it is to get business unless, of course, your goal is brand awareness. Then That’s a different matter, but really it’s not just about getting clicks to your website. It really is about measuring what’s working, repeating more of what’s working, and doing less of the things that aren’t. I hope this helps understand a little bit about AdWords, but if you have any questions, please feel free to contact me at SwoopDigital.com.au. 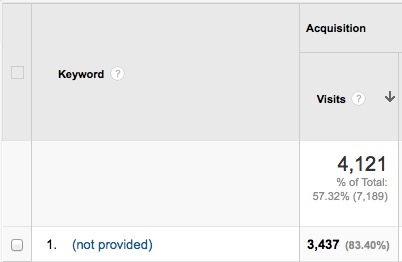 Noticed a lot of keyword (not provided) in Google analytics? You are not alone. Here’s an overview of why keyword (not provided) is increasing and what you need to do be less reliant on keywords and rankings. In October 2011, Google announced it was moving to secure search. As a consequence, searches became encrypted and concealed when users searched on Google while being signed in to their Google accounts. So if a user was signed into any Google account – be it You tube, Gmail, Analytics, AdWords etc, the search query data from organic searches is hidden in Google analytics. Since then the the number of keyword (not provided) in Google analytics has increased significantly to a point where in many cases very little data is available. In September last year, Google quietly switched all users over to secure search (SSL) regardless of whether they were logged into Google accounts or not. So in the future, no keyword data will be provided for organic searches within Google analytics. Nada. Zip. Keywords have traditionally been the lifeblood for SEO. With Google’s recent Hummingbird algorithm changes, personalised search and the increase of keyword not provided, the shift from focusing on keyword rankings to other metrics is becoming mandatory. The measures may vary depending on your website and your objectives. However, some of the possible measures may include website traffic, engagement, conversions and even revenue. We’ll cover off some more measures later in this article. What the loss of keyword data means to you? It’s time to have a conversation with your SEO provider about the goals you want to achieve and how these can be measured. The way SEO has been done in the past has changed and keeping things the same and expecting them to work simply won’t work. What can you track and measure? Total organic search visitors – did your traffic go up or down over a period of time? Conversions from organic traffic – did your revenue increase or decrease over a period of time? Did the number of leads increase or decrease over a period of time? Increases in website traffic at a URL level – are there some pages which are more strategically important to get traffic on than others? Did the more important ones go up or down? Webmaster tools data – did your average keyword positions increase or decrease? Google AdWords data – this is a great source for mining data and understanding user queries. Data from Adwords can help give you an insight into your best converting keywords and can also be used to help develop a content strategy. Historical data and trends – if you are fortunate you have sales data where you can compare your sales history, including any seasonal trends. Search rankings – data can still be obtained for now but there is a question on how reliable this data might be in the future in since browsers like Firefox and Safari also moving to secure search. Non Google keyword data from Bing or Yahoo. Traffic differences over one month are much less noticeable than traffic differences over three months. Therefore, it makes sense to not only provide monthly reports but also quarterly reports so you can gain an insights into trends. Ensure you take seasonality into account when comparing previous periods. For this it makes sense to measure not only quarter on quarter results but also year on year. Where else can you get data for researching keyword opportunities? Have you noticed that the number of keyword data in analytics has significantly dwindled? For a long time, SEO providers and businesses and have used keyword rankings to evaluate the success of their SEO campaigns. However, reporting on keyword rankings alone is often a poor measure of success. If you have looked at Google analytics lately, you may have noticed that up to 80-85% of your keyword data is obscured with the label (not provided). This means, it is increasing difficult to know what keywords are driving traffic to your website. In addition, the number of keyword (not provided) entries in Google analytics has been steadily increasing over the past year. In fact, some people suggest that eventually you will not be able to get any keyword data at all. Which means that over time you will lose the ability to understand what keywords are your most valuable. Valuable keywords are the ones that actually increase sales and leads – not website traffic. These are the ones you want to rank for. Trying to rank for high traffic keywords without knowing if they actually help drive sales means you might find you waste a lot of dollars trying to rank for keywords that simply don’t work. Therefore, focusing on rankings without understanding what revenue you get in return is pointless. For a long time, Google has been providing personalised search to all users. What this means is that if you and another user on another computer types in the same search query, you both might get different results in the search engine ranking. The result you see are personalised to you and are based on your browsing history and whether you have been on the site before. Therefore focusing on rankings which can and do from person to person, may not be the best way to evaluate your campaign. Personalised search is not new, but surprisingly very few people are aware of it. It was first introduced in June 2005 and initially impacted people who were signed in Google accounts. It was extended to all users in December 2009. We live in a multi channel world. No longer do we use only one device to surf the web. The fact is, search results on different devices can vary quite dramatically. This is because Google’s aim is to provide users with the best possible user experience. If you site is slow to load or is not optimised for mobile, there is a chance it may not appear in the search results for mobile phone users (even if it is ranked on page one of Google when you use a desktop computer). Instead a searcher using a mobile device might see those websites that are better optimised for a mobile experience rather than one that they might see on their desktop computer. The issue here is that ranking reports don’t differentiate by device and because the search is personalised, it is not an accurate reflection of a businesses rankings in Google. Instead of showing results to users based on keyword, Google now shows results based on the type of query they have. Pre August 2013, if a user typed in where’s the best place to buy an iphone 5, Google would have looked for a website optimised for “buy iphone 5” and might have shown stores where you can buy an iphone 5. However, with semantic search Google is more likely to deliver a result more similar to the users query. Instead of showing several stores where you can buy an iphone 5, it might show things like a blog article about where the best place actually is to buy an iphone 5 based on a user review. Similarly, a search for “acid reflux prescription” used to list a lot of drugs, which might not be necessarily be the best way to treat the disease. Now, Google says results have information about treatment in general, including whether you even need drugs, such as this as one of the listings. 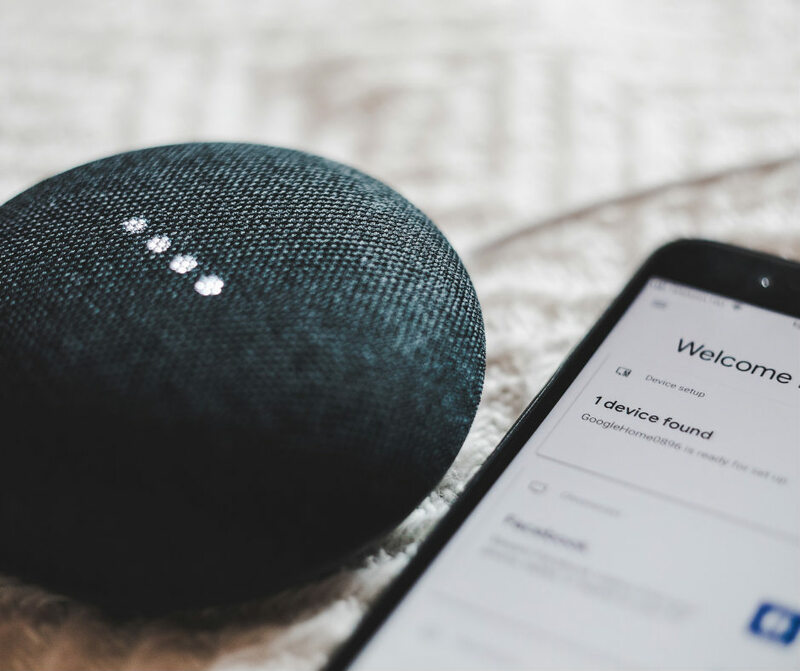 The change recognises the fact that our searches are becoming increasing more complex – many of us do not type keywords into Google anymore – instead we type questions and we expect Google to deliver the answers. Focusing on keywords alone therefore is not useful unless we can use the data to help understand our customer better. The more we understand our customers, the more you can deliver a better experience to them on the web and increase the likelihood they will buy from you. With this in mind, you may find you need to increase the number of pages on your website to capture the wider variety of searches in Google and at different stages of a users decision making journey. Success with an SEO campaign needs to be measured on several levels besides just keyword ranking. What time period should you track? Search engine optimisation takes time and is subject to daily swings. Therefore while it is good to look at keyword rankings & organic traffic at a monthly level, you should also see if your business results (i.e. sales / leads) are improving on a quarter by quarter basis as well. This is because some businesses are quite seasonal and business results at a monthly level can vary substantially. On a final note, you might find you have been blogging and adding content to your website without much success. Make no mistake, having a sound content strategy is a must. If you are finding limited success, then it is worth considering getting professional help. A lot of business struggle to fix their Google Places listing. They get frustrated because they really want to help their customers (and prospects) find them easily. However, months go by. Despite their best efforts, nothing changes. They despair of ever being able to fix their listing. Perhaps, you have you found your business in the same situation. If you’ve had this issue, read on! Here’s a possible solution that could save you hours of despair. We used this process to help a client fix an issue within 24 hours (or pretty darn close to it). If like us, you thought Google Places was broken then you are in for a big surprise. If your Google Places listing looks fine, check your website to make sure it shows the correct address and contact details. If you have a Google Map embedded on your site, click on the map and make sure it is also correct and directs to the new address. Check your listings in other directories like Hotfrog, Yellow Pages, True Local, Start Local etc. Make sure your business name, address and contact details are consistent. If they aren’t you are going to need to get in touch with those directories and fix them. If your places listing still hasn’t changed – go to Google mapmaker. 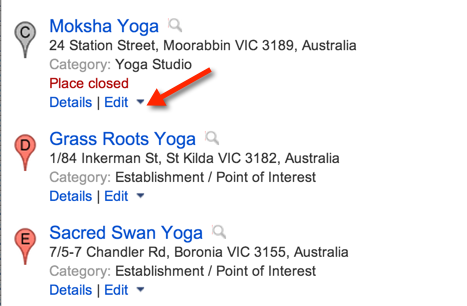 Type in your business name in the search bar and check that your business does not have multiple listings in Google maps. If you see multiple listings – bingo! Congratulations you have just found the issue. Navigate to the incorrect listings and click on the edit link. 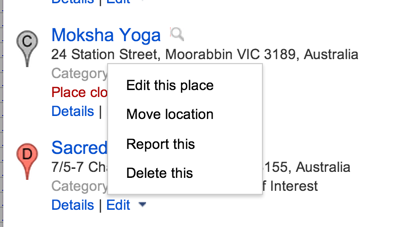 You will have the option to move the location, edit or delete (and even report). Wait for a reviewer to review the listing (and hopefully approve it). If you want to speed up the process, ask a couple of locals to review the listing for you. Wait! Once your listing has been reviewed you should receive a notification to confirm the changes. Congratulations! Months of frustration are nearly solved. Get ready to pop out the champers! Want to take your maps listing to the next level. If you want to get really funky, you can also display a picture of the inside of your business in Google Maps. Sheesh – you really want to know everything don’t you. Engage a Google Trusted photographer. You can find out at Google Maps Business View. For a small fee ($500 plus), you can hire a Google Photographer to photograph the inside of your business so potential customers can see your business on Google Maps. It’s a great way to showcase businesses like hotels, restaurants, tourist destinations or even gymnasiums. So what are you waiting- get cracking and fix your listing in Google Maps today!